It’s time for the KS test kitchen to get some action again! 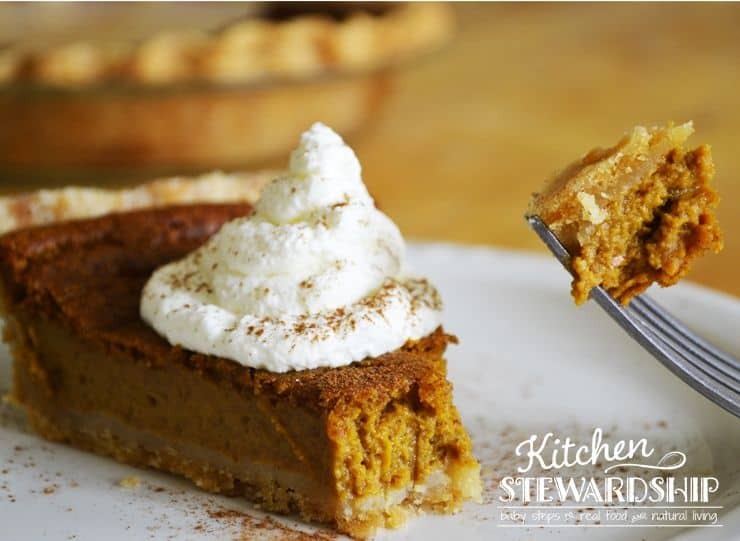 Today we’re testing a few different ways to make healthy pumpkin pies, deemed “healthy” because even though the pumpkin pie still contains sweetener, it’s farrrrrr less than your average pie and all the other objectionable non-food ingredients have been removed. It’s still not as healthy as a salad or chicken soup with homemade chicken stock or anything, but it’s so much better than what we’re used to seeing this time of year. 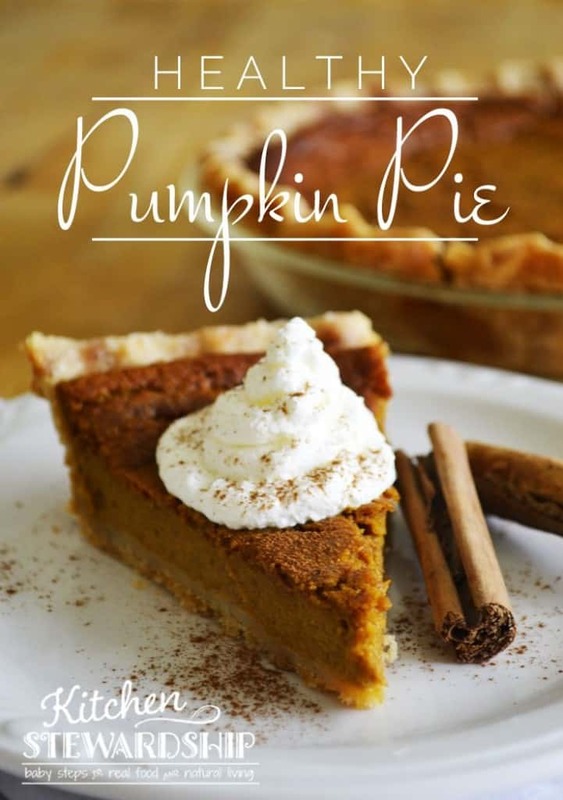 This recipes includes pumpkin, which is a super food, eggs (don’t let anyone tell you those aren’t healthy), heavy cream instead of canned milk (clear improvement; I believe in saturated fat), yummy spices, and only a quarter cup real maple syrup per pie. Compare that to a cup of sugar in most pumpkin pie filling, and I’m tickled to serve this for dessert (or, um, breakfast, day after Thanksgiving, baby!!). 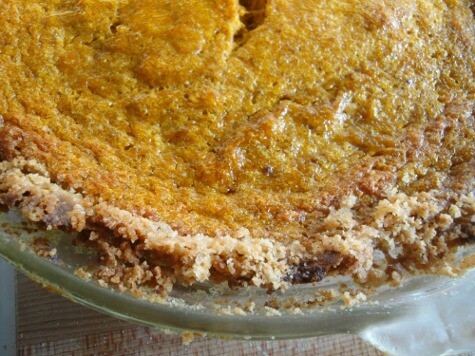 The crust is whole wheat and uses your choice of healthy fats (even though some say a pie crust is the one place one should always just use white flour!). It’s good, and I’ll even show you how to roll out a crust using my grandma’s tips (she is a totally amazing pie maker). Now…enough chit chat. 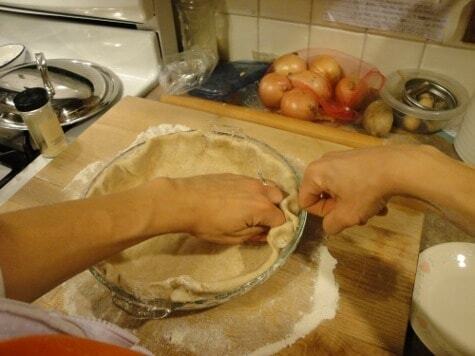 Let’s get to the pie-making. I’ve been fiddling with a homemade pie filling that is both easy and delicious for the last few years. (It’s always my job to make the family Thanksgiving pumpkin pies.) I knew basically the spices I wanted and the big change that I was testing this time was leaving the eggs in the filling whole vs. separating the eggs, whipping the whites into a meringue, and then adding the yolks later, or also separating the eggs and whizzing them into foam, but not quite meringue. Can you tell which one is fluffier? Ha! In the photos above, you can tell the one with separated eggs because it is in a crumbly crust (I was testing another blogger’s barley crust, and it didn’t go so well), plus the filling is so much fluffier. That step makes a HUGE difference. 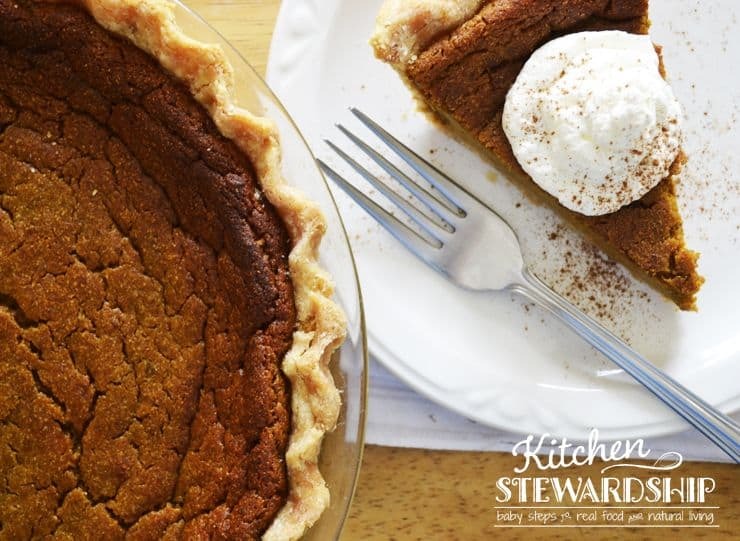 Without separating, it’s like a traditional pumpkin pie. Custard-ish. Normal. With the whipped egg whites, it’s truly lighter and more airy. Can you tell the difference in the slices? The meringue egg whites are in the piece with the whipped cream. I’m going to go out on a limb and say that it’s worth the extra time and dishes to separate the eggs, especially since you probably don’t make pumpkin pies all too often. If you’ve been following KS very long, you’ll know that that’s a big deal. Extra dishes, and I’m saying they’re worth it? Uh huh. This pie is that good. 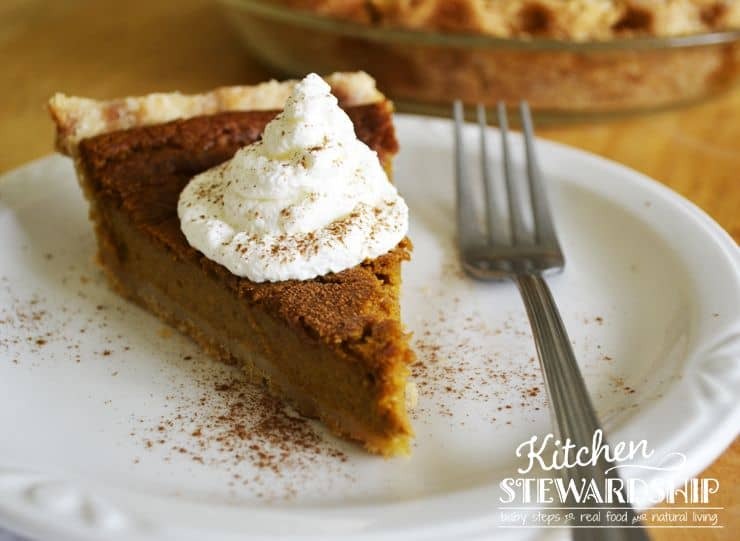 No cans needed for this pumpkin pie – perfect flavor and crust every time without any processed ingredients. Healthy enough to eat for breakfast! Turn the oven on to 350 or 400F. Scrub a whole pie pumpkin. Put the entire pumpkin into oven for 10-15 minutes as it preheats. Remove pumpkin, which will now not break your knife. Slice pumpkin in half – any direction will do. Scrape out the seeds and stringy stuff, reserving seeds for making crispy pumpkin seeds. 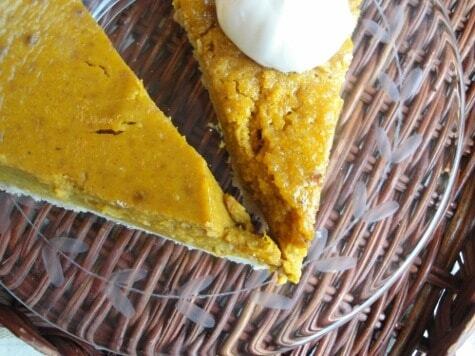 Place pumpkin halves, cut side down, in a baking dish or cookie sheet with at least a half inch of water. Bake for 30-60 minutes until you can pierce the rind with a fork. Allow to cool. Scoop out pumpkin flesh and puree. I doubt this would work in a blender unless it’s a high-powered blender like a Vitamix or Blendtec. I used the food processor* here mostly only because I was going to use it to make the crust and filling anyway. On a non-pie day, I much prefer the ease of use and cleanup with an immersion blender for pureeing mushy orange vegetables of any kind. Scoop the pumpkin out of the machine and set it aside. Rinse the food processor or scrape very well with a spatula. In the bowl of the food processor, pulse the 1 ½ c. whole wheat pastry flour (mine happened to be freshly ground), ½ tsp. salt, and ½ tsp. sugar, for the pie crust a few times. Cut ½ cup extremely cold leaf lard or butter into about 8 pieces and add to mixture, pulsing until it looks like cookie crumbs. Dribble 4-5 Tbs. ice water into the food processor while it’s running, but stop it as soon as the dough begins to stick together. With your hands, finish pressing all the dough together. Add more water if absolutely necessary, but try not to if you can. 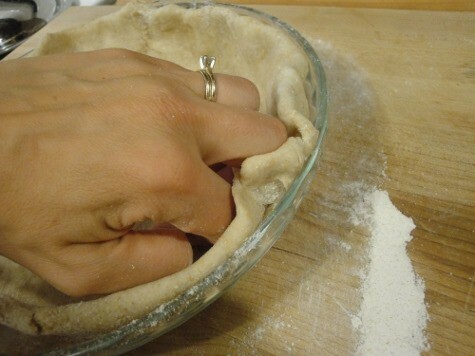 Also try to handle the dough as little as possible; this will ensure a flakier crust. Form dough into a ball and place in refrigerator for at least 30 minutes. In the meantime, work on the filling, also using the food processor. 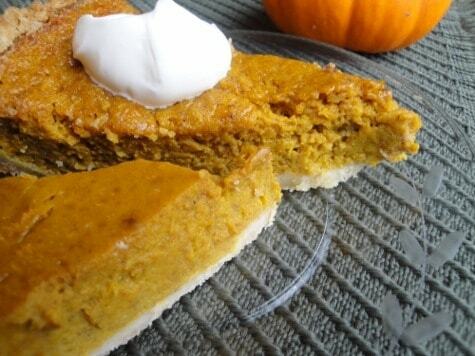 If a little pumpkin gets in your crust or a little crust in your filling, it’s no big deal. Separate egg whites and yolks. Whiz egg whites in the food processor until frothy* and then remove to a separate bowl. 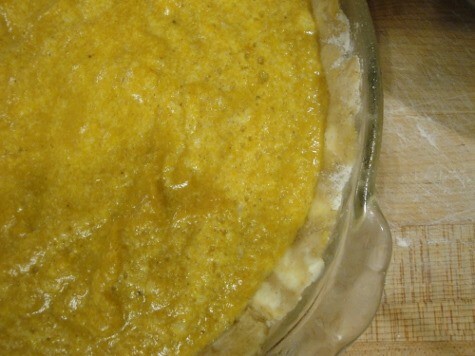 Process the egg yolks, maple syrup, pumpkin puree, spices and cream until evenly mixed. Fold in the egg whites with a spatula. For best crust, place a metal cookie sheet on the bottom rack to radiate heat (also protects oven from a mess if the pie bubbles over). Bake in a preheated 425F oven for 15 minutes, then reduce the heat to 350F for another 40-45 minutes or until a knife inserted in the center comes out clean. Cool on racks. 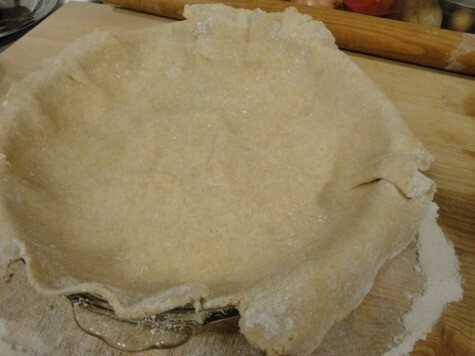 If the crust begins to brown too much on the edges, move the pie down a rack OR cover crusts with aluminum foil. Even better, believe it or not: Use a stand mixer with a whisk attachment (or a really strong whisking arm) and whip the egg whites all the way into a meringue with stiff peaks. Need crustless? Pour into a greased pie plate or 8×8 glass dish, and bake at 375F for 45-60 minutes (until knife inserted in center comes out clean). You might want to taste the filling before baking – I didn’t use salt, and it was really good, but I noticed that the recipe on “the can” that I used to like calls for 1/2 tsp. salt per pie. I hate for your flavor to fall flat because of no salt…I think I’ll add 1/4 tsp. this year and I bet it’s even better! No heavy cream? Whole milk will work in a pinch. For a creamier yet tangy sort of flavor, use about 1/3 c. sour cream in place of part of the milk in the substitution above. It’s good! Got an extra half hour? Freeze the crust after it’s in the pan for 30 minutes before filling/baking and it will taste even better. Pie filling adapted from Out of the Box Food; pie crust adapted from my grandma. 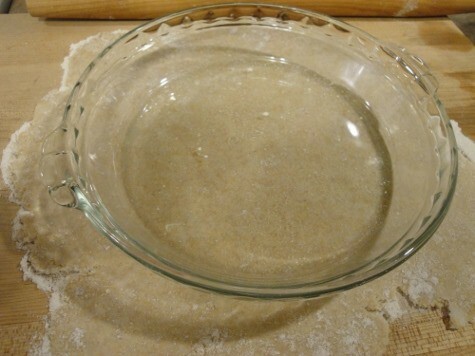 Make the dough in a food processor following the directions above or use a pastry blender and fork to toss in the water. Either way, try not to handle the dough for even a second longer than necessary. 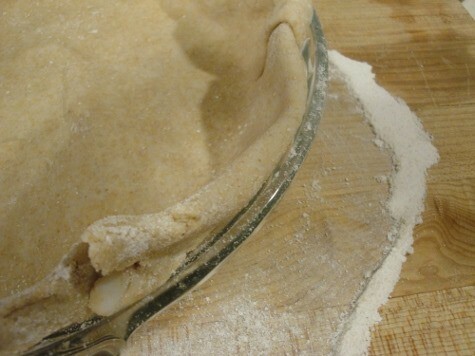 Put pie dough in an airtight container and allow to rest in fridge about 30 minutes before rolling out. Very, very thoroughly flour all your surfaces. 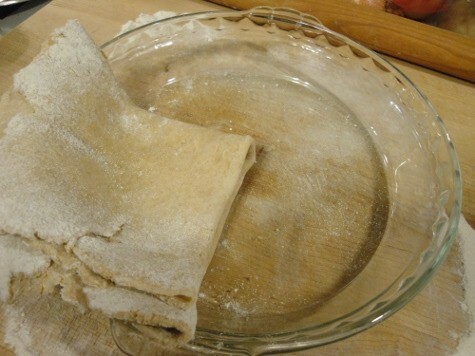 Flatten the disk of dough in the center and roll out from the center to the top and bottom, and then from the center to each side. If you’ve managed to roll it more or less evenly, you’ve done better than most people think they can handle (but it’s really not that hard!). 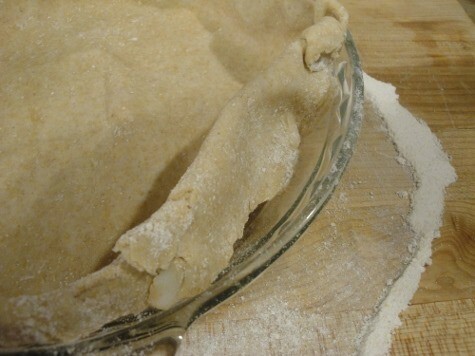 Moving the pie crust, however, can be very tricky if you don’t know how to move it without tearing the dough. 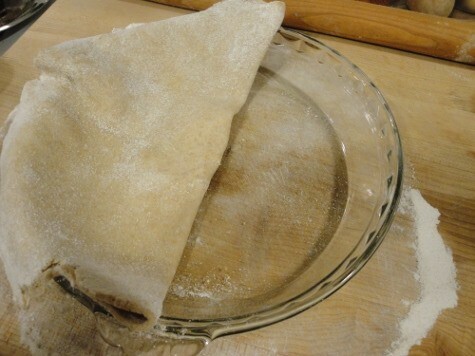 Fold the pie dough circle in half, then in fourths. To do this, pick up the edge with one hand and flip over about an inch or two into your other hand, palms flat and facing each other, then back to the first hand, then flip again, so that you’re passing the dough back and forth, gently easing it bit by bit off the rolling surface. Stop when it’s folded in half, then do it again vertically. There are lots of ways to finish off the edges, from using a fork to special tools to your knuckles, like I do. 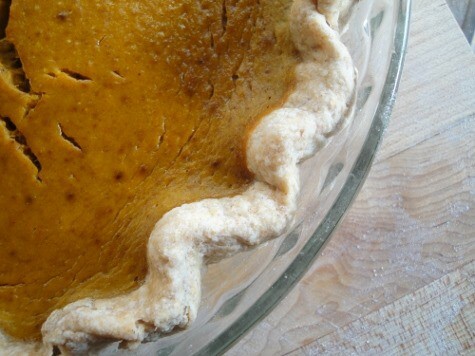 The purpose of this technique is to make a pretty crust, of course, but also to seal the edges – which is more important on a 2-crust pie than a one-crust pie so all the filling doesn’t ooze out. I didn’t think I’d be able to demonstrate this part but was going to ask you to use your imagination to fill in the blanks – see the imaginary other knuckle between these two? I actually switched to using my right index finger and left knuckles after the photo so I could sneak between the pie dough and the glass plate better, but I figured I’d drop the camera if I tried again. What Fat is Best for Pie Crust? It was stiff, a bit difficult to roll out but not impossible (compared to butter, which is what I usually use). The dough held together really well and so did the baked crust. It tastes good, but nothing to write home about, and I’m not sure I’d say lard is the only way to make a pie crust. My friend, whose last hold out on Crisco was pie crusts, says that lard and butter don’t hold a candle to Crisco – and then she tried palm shortening. She was won over! If you’ve got a love of baking or a passion for flaky, light pie crusts, try it. It’s very easy to work with, not hydrogenated like Crisco but naturally solid, and it goes on sale quite often at Tropical Traditions. 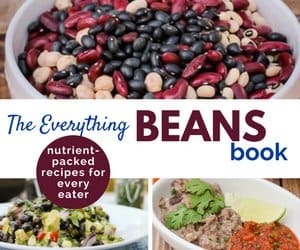 I can’t wait to hear if this revolutionizes your Thanksgiving dinner – or even becomes a part of your life more than once a year! I grew up on Chiffon Pumpkin pie and much prefer the condensed texture and flavor of the custard. Since I’m gluten free I bake the filling in individual cups and drizzle maple syrup over the top before serving. I’ve also burnt sugar on the top ala pumpkin brulee. Fantastic warm. I think for egg sub and still be healthy and natural you could use flax seed meal soaked in water. It’s only a couple tablespoons and it would give the right body and probably go unnoticed in the very textural pumpkin. And a little grit won’t hirtcnayway. But I make flax bread all the time and it’s not gritty, nice and chewy, except that image it with, um, eggs. ;-). No really, it should work. I just don’t know the proportions. I think While New Mom has it. Another option would be xantham gum or gluccomanan (that is recommended by THM). Just try to make sure it’s an organic source. I’ve definitely used flax eggs (1T ground flax : 3T warm water) in baking, I’m just unsure about how that would do in a filling but I bet you’re right it would do just fine! And you’re right, the glucomannan would do a good job thickening things up as well. This filling is similar to a recipe I already use. I do like the custard filling, but I’m going to try your recipe with the whipped eggs. I might do a pumpkin pie taste test. 🙂 I’m going to try your crust too, because the truth is, the crust I use is horribly unhealthy. It’s almost a sugar cookie-for-crust thing. A confession: I love pie. And I bake and eat a lot of pie. Yum. My experiments with whole wheat crusts have not come out very well, but I haven’t tried WW pastry flour. The lowest protein flour I keep on hand is unbleached AP, and I’m not eager to add to my flour collection! But I might try it, if I see it somewhere. Question: what’s the protein content on the WW pastry flour you use? On the question of fat, for most pies I like a mix of butter and lard, usually 2/3 lard 1/3 butter. Looking forward to trying this recipe, with separated eggs. But I’ll be doing it with sweet potatoes instead of pumpkin. Yum. By “pastry flour” do you just mean it’s ground extra fine? Normally, cake and pastry and all-purpose and bread flour all are defined by their protein content. If my memory is correct, pastry flour is supposed to be somewhere around 9%. Most whole wheat flour tends to be around 15%. Big difference. 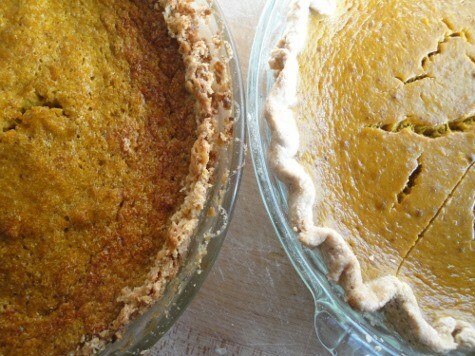 Forgive my ignorance, but what is the difference between a pie pumpkin and any old pumpkin you would find at the store? Can’t wait to try this recipe! be sure to drain the pulp after cooking. 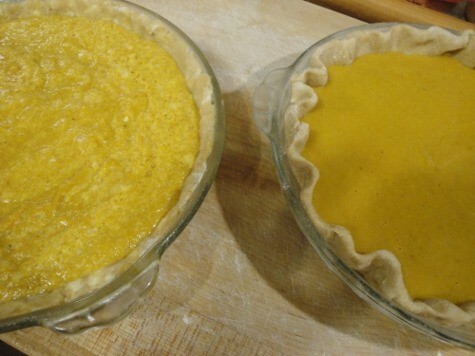 Regular pumpkins have a lot of water in them and you end up with a soupy mess when it is cooked for pies. I’ll have to try separating the eggs! Looks yummy! I use half butter and half coconut oil for my crust. I put both in the freezer for 10-15 min before throwing it in the processor. Also, I love my stainless pie pans. I can put the crust back in the fridge to get cold after I roll it out, then fill and go straight to a HOT oven. You mention palm shortening for crusts. You should remind people to get palm oil or shortening from a sustainable source that doesn’t contribute to deforestation. The link you provided is for sustainably sourced palm shortening- I just thought you should make that explicit. Personally, the last couple years I’ve been making my crust with all butter. I cut it in so that there are big lumps of butter throughout and refrigerate it before rolling out and it turns out just like puff pastry- it gets a little chewy the second day but it rarely lasts that long. I do like denser crumbly crusts with shortening but they never turn out very well. Good call; I forget that one! We are hosting Thanksgiving this year, and I am excited to try this recipe. Putting it on my prep list and saving….unless I get a hankering to try it sooner! Could I make this now then freeze until the holidays? Any suggestions on how to cook it after being frozen? You ARE “hot stuff”!!! Thanks for your posts! We’ll be making a crustless pie again this year. Those dang grains and all….. Thank you for ALL this detail. I’m excited about trying this recipe. 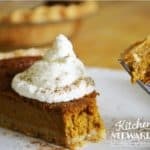 I’ve gone “sugar free/white flour free”, and I’m looking for some healthy alternatives to give make for my family for Thanksgiving. I’ll let you know how it goes from a ‘lay baker’s’ point of view. I’m looking forward to trying this! I think I’d prefer the custard texture for the filling though. Is the only difference there *not* separating the eggs? Could you use coconut cream in place of the cream if you are dairy free? Hmmm…I don’t know if that would be a good sub, since the coconut cream is so thick and oily, and pretty solid at room temp (at least the jars I have from Tropical Traditions). I would totally try a can of coconut milk though. I bet it would be perfect! Can I use honey instead of the maple syrup? hey there 🙂 You can always swap out honey and maple syrup, volume-wise. Just keep in mind it might give a different flavor. Other than the obvious (it’s in a can) can you tell me why you wouldn’t recommend canned puree pumpkin. The ingredients list consists of one ingredient. Pureed pumpkin. I totally get avoiding shortcuts for some things. (canned cream soup at the top of the list for me) but with so many things going on in the kitchen. I need a better reason than. “I don’t recommend it”. Canned pumpkin is one of the only canned foods I use. I just don’t have time to cook and freeze enough pumpkin in the fall to last all year (we actually use pumpkin a LOT as a replacement for allergens). It certainly does taste different, though! You can taste the can. Canned pumpkin has to be cooked to get the metallic taste out.